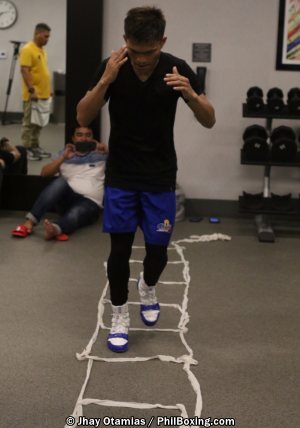 PHOTOS: JERWIN ANCAJAS WORKS OUT IN L.A.
Filipino IBF superfly champ Jerwin Ancajas immediately buckles down to work upon his arrival in Los Angeles Tuesday. Ancajas will defend his title against compatriot Jonas Sultan, who arrived in Los Angeles two weeks earlier, at the Save Mart Center in Fresno, California on May 26. The last time an all-Filipino world title fight happened was 93 years ago when hall of famer Pancho Villa (Francisco Guilledo) defended his title against Clever Sencio in 1925 in Manila.